When I came across NECA's Slimer a few years back, I was excited - here at last was a Movie Maniacs-style Ghostbusters figure. The Ghostbusters themselves had been requested for ages by fans of McFarlane's Movie Maniacs line, which by then (2004 or so) was more-or-less defunct, but NECA was already picking up the slack with their Cult Classics. While NECA produced excellent versions of Slimer, Gozer, the Stay-Puft Marshmallow Man and Zuul (I own Slimer and the SPMM, but man, do I wish I had a Terror Dog), they were unable to secure the likeness rights to the four main actors. Enter Mattel, who - five years later - are finally offering the realistic, movie-based Ghostbusters action figures fans had been clamoring for since the days of the cartoon-styled Real Ghostbusters. Thankfully, Mattel appears to have thrown the weight of the largest toy company in the world behind getting Bill Murray to sign off on his likeness. The figures will be sold exclusively through Mattel's site at a price of $20 per figure. On first glance that appears to be quite steep, considering that the significantly larger MotU Classics figures cost the same, but keep in mind that MotU is an in-house brand owned by Mattel, while both the Ghostbusters license and the actors' likeness rights had to be purchased. That's why most licensed toylines always seem so expensive compared to similarly-scaled in-house lines. This is a "slimed" variant of Egon, available at the San Diego Comic Con. 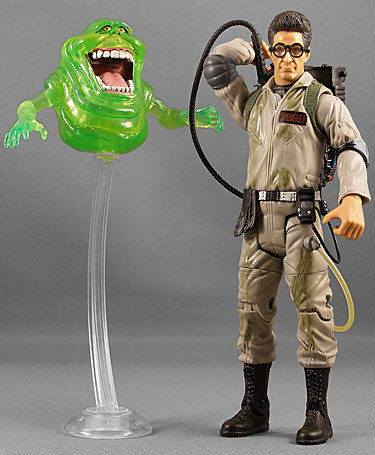 A non-slimed version of Egon with a PKE meter will be released eventually, as will a painted version of Slimer. The next figure will be Ray Stanz in October. Egon and Slimer come in a pretty elaborate package. Mattel seems to have learned to showcase the contents better, allowing a good view of the entire figure (although there's a lot more packaging plastic - a.k.a. "trash" - than we'd like to see). The Terror Dog graphics bookending the figures are a nice effect (and hopefully signify that a Terror Dog figure will be part of the line eventually), and I love the big Ghostbusters logo on top of the blister. The package is very collector-friendly. The blister is glued to the card only by a flap on the bottom - the rest of the blister is attached with reuseable plastic tabs and a little tape. You'll have to cut the tape to open the toy, but once you do you can easily replace him just by snapping the tabs back in. The biggest issue here is the head sculpt. The prototype was very good, so this is clearly a case where the likeness was softened by the production process. Egon now looks as much like Dustin Hoffman or John Turturro as he does Harold Ramis. Seriously - when looking at that head I can see all three likenesses revolving from one to the next to the next, like the T-1000's death scene in T2 where he goes through all the people he mimicked. I should say, the raised right eyebrow saves the Ramis likeness, and it does look quite a bit like him from the side. Then there are the big, ugly glasses. Honestly, I just don't know how much can be done to improve glasses in the 6" scale on a mass market-style figure like this (DCSH Clark Kent's weren't much better - and even NECA has a hard time with them). 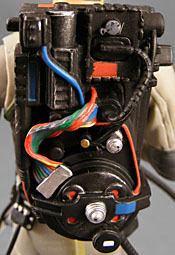 Egon's torso, arms and legs are molded in beige plastic, while his hands and head are molded in flesh color. 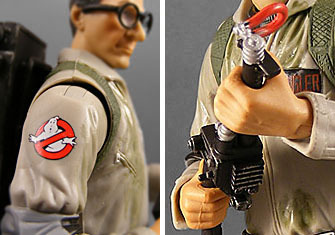 The proton pack and "neutrona wand" (i.e., the gun) are made from a rather soft rubber that bends very easily, but fortunately Egon's hands are articulated well enough that you can keep it straight. Still, a stiffer neutrona wand (quit snickering, children) would have been nicer - perhaps we'll see it on future 'Busters. The gloves and other devices hanging from his belt are also made from soft rubber, so his ability to bend at the hips isn't significantly hindered. The wires are all strong and not likely to break without some effort. They might even survive a little child's play. For the most part, the paint work is quite good too, similar to the better work on the Dark Knight Movie Masters. The "slimed" effect here is really rather subtle; Egon looks more as if he's just had a tough day in the field than a close encounter with the Ugly Little Spud. The tampos used for the nametag and Ghostbusters symbol are flawlessly applied, which I think should be noted given Mattel's previous issues with paint applications. Egon's articulation is a tad different than we've seen with DCUC or MotU Classics. He has a balljointed neck, but the joint is actually where the torso meets the neck, not where the neck meets the head. He has swivel/hinge shoulders and elbows; usually I don't like that sort of joint, but here it works because A) swivel biceps don't work well on characters with loose clothing, and B) the joint is entirely hidden by the elbow pad. He also has a swivel-hinge at the hands, which allows him to hold his wand in a nice variety of poses. He has swivels at the waist, lower thighs, and the top of his boots, hinges at the knees and ankles (along with "rocker" side-to-side motion for a wider stance), and the H-hinge at the hips as seen on DCUC and Movie Masters. There's a noticeable lack of an abdomen hinge, and I can't decide how much I miss it. It really helps in posing, but clearly it would hurt the sculpt a lot here, so it's probably best they skipped it. 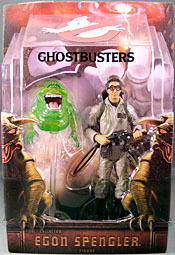 Egon comes with a translucent Slimer. He was designed to be painted - this translucent one is technically the variant, even though it's been released first. 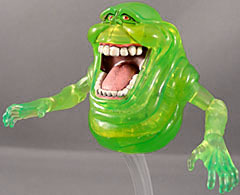 It's inevitable that this Slimer will be compared to the NECA one, and it's really no contest - NECA's Slimer is more accurate to the film and features a much more detailed sculpt, as well as an awesome "slime trail" stand (as opposed to the generic clear swoosh we get here). To be honest, I don't think we'll get a fair comparison until we see the painted version. 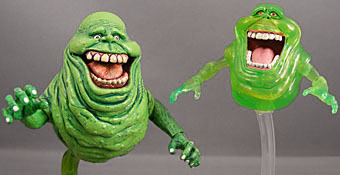 The Mattel Slimer does have some advantages on his NECA counterpart. 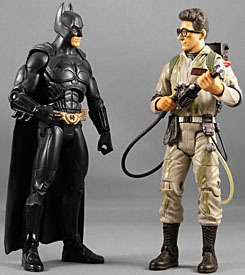 Obviously he's more in scale with Egon than the NECA version. He has an extra point of articulation with the elbow hinges, and he more closely resembles the Slimer of the cartoons, which is likely a plus for many Gb fans. Also, the translucent plastic used for his sculpt really does add a certain ghostly quality to the figure. We'll have to see how the rest of the line turns out. It's already known that they'll be using the same body for all the Ghostbusters, and while this fairly slender body looks great with Egon and will probably be fine for Peter and even the somewhat-beefy Winston, Dan Aykroyd was simply not this svelte in his Ghostbusters days. Even the Minimate Ray is a little fatter than the other 'Busters. The only thing that really bothers me about this set at all is the head and glasses, and those - and the price - knock this figure down a bit. 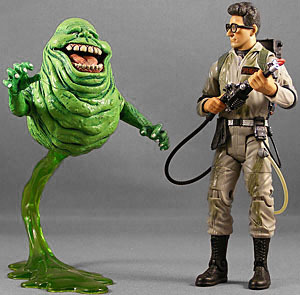 But ultimately, I'm a Ghostbusters fan, and having a realistic figure from the movie like this is a dream come true.